i've mentioned before that i am the birthday/event girl at work. whenever there is a birthday/event everyone turns to me to bring baked goods into work. i'm still not totally sure how i inherited this job, but it is mine nonetheless. i try to balance out what i bring into work. the last event we had at work was my co-worker's birthday and i made chocolate chip cookies. however, right after that birthday, i needed to bring in another treat for a different co-worker's last day. (i'm really going to miss her by the way.) instead of doing two sweet treats back-to-back, i decided to make muffins instead. whole muffins present a bit of a problem in a work setting. people don't seem to want to eat large muffins (or cupcakes) at work, so i have started making mini ones instead. let me tell you, mini muffins (or cupcakes) are perfect for the office environment. they are practically bite size. on to the muffins . . . can you tell i have been on a lemon kick lately? i just love lemon recipes when the weather is warm and the sun is shining. 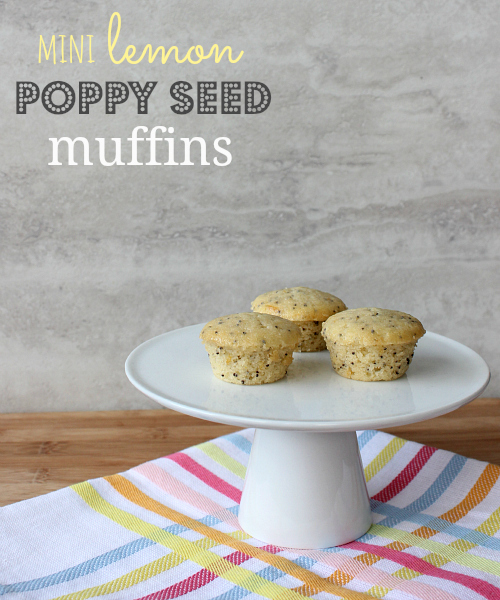 i think this recipe is going down as my favorite lemon poppy seed cake/muffin recipe. it's that good. the muffins are moist, not dry. they are light and fluffy, not dense. they are tart, not too sweet. they are just perfect. 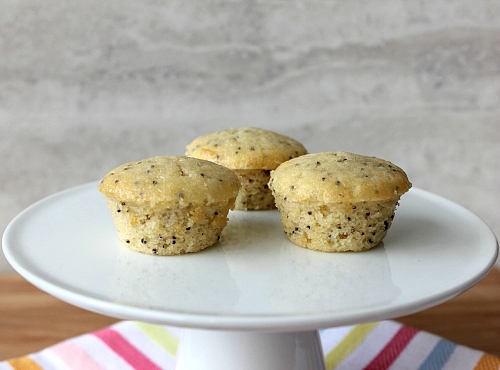 the addition of the poppy seeds adds just the right amount of crunch too. you could make these as regular sized muffins, you just need to adjust the baking time a bit. you could also make this recipe in a loaf pan too. slices of the loaf would look just lovely with the poppy seeds sprinkled throughout. 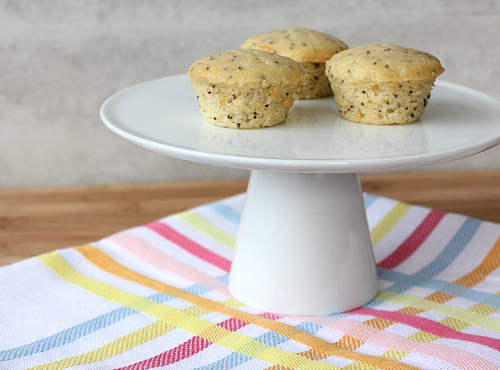 these muffins would be perfect for an office event, or a brunch. their little size makes them just right for large parties (or for popping in your mouth on the go!). in the bowl of an electric mixer, beat the butter and sugar together until light and fluffy (about 3-4 minutes). add the eggs, one at a time, beating well after each addition. sift the flour, baking powder, and baking soda into a large bowl. zest and juice the lemons. finely chop the lemon zest and add it to a bowl with the lemon juice. whisk the milk and vanilla into the lemon juice. add half of the wet ingredients to the butter and sugar mixture and beat well to combine. add half of the dry ingredients to the mixture and beat well to combine. repeat with the second half of the wet and dry ingredients (ending with the dry ingredients). beat well. stir in the poppy seeds. 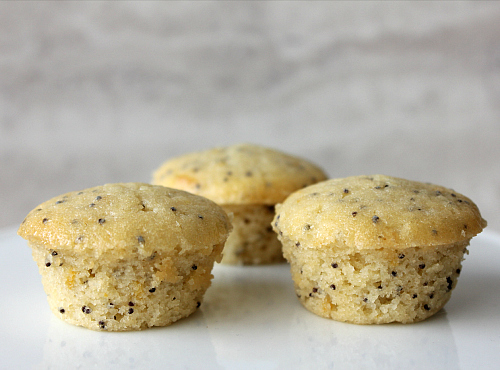 spoon the batter (approximately 1 tablespoon per mini muffin) into a well-greased mini muffin pan. bake for 25-30 minutes or until a toothpick inserted into the center of one of the muffins comes out clean. once baked, allow the muffins to cool in the pan for 5 minutes before removing them from the pan and transferring them to a wire rack to finish cooling.